7 years ago, Kamilla from Russia did a summer internship at Inchoo. This year, we had the opportunity to host Ulyana Kiklevich from Belarus on an internship that was organised through IAESTE. 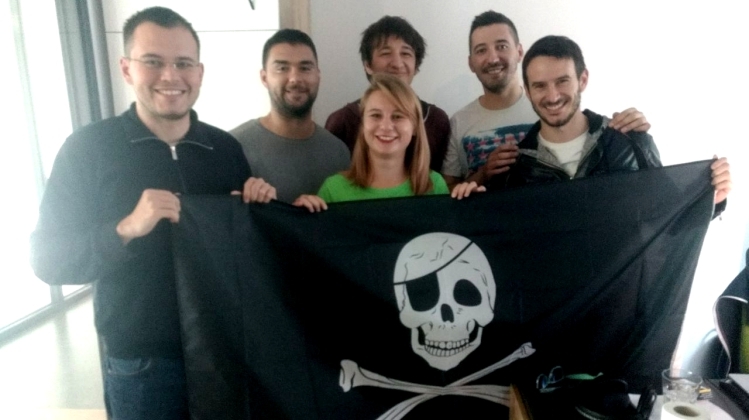 We’ve prepared an interview to get to know Ulyana, see how her days as frontend developer intern at Inchoo went, what she learned, and why she decided to travel back to the Croatian coast with her parents. Hi Ulyana, can you tell us something about yourself? My name is Ulyana Kiklevich, I am 20 years old. I’m from Belarus, Minsk. I am a full-time student of the Belarusian State University of Informatics and Radioelectronics, with the specialization in “Computing machines, systems and networks”. I’m a technically-minded person, so it’s interesting for me to develop something new and solve some interesting tasks. I always try to improve my skills, learn something new, and look for new possibilities. I manage to work and study at the same time in Minsk, so I don’t have a lot of free time, but when I have some I read books, go to the cinema or play chess. I really believe that I’m the luckiest person in the world because I’ve got this amazing opportunity to be at Inchoo for the internship. How did you decide to get an internship at Inchoo? I’ve read a lot about your company, and what you do, so when a position appeared – it was easy to make a decision to apply for the internship. I prepared a lot because I really wanted my country and my university to be proud of me. Also, I didn’t want Inchoo to regret accepting me. I tried to do my best, and I hope I did it. Your internship is almost over. Did those 6 weeks fly by quicker than you expected or you couldn’t wait for the internship to be over? I’ve been here for 6 weeks and it’s the most significant experience in my life. First of all, Croatia is unbelievably beautiful country. This nature, these mountains – it’s amazing! I’ve made so many photos and I regret all the time that my camera couldn’t capture how beautiful everything around me is. Then I’ve met Croatian people. You are so kind! So friendly, so open-hearted, so warm and hospitable. I really admire your nationality, your culture, and people. And of course, I adore my job – and your company. I really enjoyed coming in the office and saying “Jutro!” every morning. Your office is so progressive, and Inchooers are so smart and interesting. You have Big Pizzas days and it’s incredible! I’m really happy for every day that I’ve spent at Inchoo for the last 6 weeks. What were your exact tasks while interning at Inchoo? Can you tell us what you learned during these 6 weeks? My main tasks were creating some HTML pages for an online shop (we all know that life is too short to buy offline). I had some basic knowledge, but I never worked with web shops. So, my mentor showed me how professionals do it, and how to work effectively with maximum improvement. I found out some features that would be useful for me in future. Also, the task included many spheres, so I could really use all of my knowledge. What part of the internship would you say was the most interesting and what part was challenging? The most interesting for me was getting advice from my mentor. I’ve never worked with such a professional and clever person. No one in the world could make the studying process so interesting and interactive. Who was your mentor? How were you accepted by other team members? My mentor was Nenad Andrakovic and he was the best! I was happy to meet him, I found out so much and got a huge amount of knowledge thanks to him. The team was great – they are all so sweet and funny (I didn’t understand all of their jokes, but they laughed a lot and that made me smile 🙂 ). They never forgot to invite me to coffee break or share chocolate with me. Everybody tried to help me and I really think it’s impossible to be kinder than Croatian people are. Can you describe your typical day at Inchoo? Well, I usually come early, I ring the bell downstairs and poor Dunja has to run and open it for me. Then everybody says “Jutro!”, and I start my workday. About 20 minutes later my “cool team” starts to come. They discuss something in Croatian and sometimes I understand them (but they don’t know about it), so I can listen to them and even take part in their conversation. Then I ask my mentor some questions about the task or Nenad asks me if I’m fine. Then we either discuss my questions, or just start working. At 10:00 guys always (I emphasize – always!) invite me to drink coffee with them. After that, I have lunch and start working even harder (I hope Nenad is reading it and appreciates it). At 4 PM I’m leaving, and everybody says “Have a good evening!”. And that is why I love my job here. How would you explain and describe Inchoo and Inchooers in a few sentences? Inchoo is the most progressive, dynamic, interesting, effectively organized and quality oriented company I’ve ever seen. I’m really proud that I had a chance to work here. You are really the best. I admire all people working here and admire the ambiance here. I will never forget your company. I will never forget the experience you gave me. You can’t even imagine how much you gave to a student from Belarus. What do you think of Osijek? How did you spend your free time here (afternoons and weekends)? Osijek is a very beautiful, calm and slow city. I enjoyed walking to work in the morning; I could buy breakfast on my way, meet some people, take sunbaths and listen to music. The city is so peaceful and cozy, I really love it. Usually, in the evening I had time to go to the café with my friends, also I went to the swimming pool (thank you Antonija for the ticket) or to the river. I rode a bicycle (thank you Tomislav for the bicycle), traveled a lot (thank you Andreja for your power bank). I was at Jankovac, at Plitvice, at the seaside, and in Novi Sad, Serbia. The only thing I regret – I had too little time to see all of the places I wanted. A good reason to come back. Can you compare life in Belarus and Croatia? It’s hard for me to compare our lives. I live in a big, noisy city, but here I see calm and peaceful life. Sometimes I notice that people in Minsk are always in a hurry, and that’s the main difference between us. But I should say, that people in Belarus are kind and hospitable as well. We honor our traditions and our history. We are always happy to meet new people and have guests. Our tables are always full of food for our guests and we are cheerful. And these are our common features. I hope I left a good impression about Belarusian people. Are you looking forward to going back to Belarus? What are your plans after returning home? Of course, I miss my country and my family. It was the first time I left home for so long. But if I had the chance to stay longer here – I would love to. After returning I’ll start my new college year and will tell everybody how lucky I am and how great this time was. I want to continue working in the field I used to work here: now I know more and I hope that I can be really useful in a team. Do you plan on coming back to Osijek/Croatia? I’d love to come back. Adriatic Sea is the most beautiful sea ever. I decided I would come back here with my parents. I want to show them your nature, your lakes, and waterfalls, your parks and mountains. Everybody should know how amazing your country is! In addition, I’d like to send to my team my sincere greetings and thanks. Nassau-guys, thank you for every day here, for every smile and warm word. Thank you Vanja and Goran for your temporary company and help. Thank you, Tomislav Bilic, for the chance and opportunity you gave me to take a small part in this beautiful, interesting Inchoo world.